Wearing a column of colour, which means wearing the same or a similar colour both on the top and bottom, accentuates the mighty unbroken vertical line. The denim on denim trend is a great look in my book and that’s precisely how the column of colour is created in this ensemble. 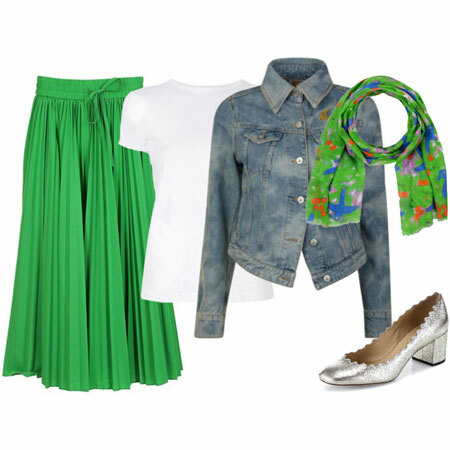 Here are the components of the outfit, and you’ll probably already have some of the items. So shop your closets and start experimenting. Choose any style of jeans. I’ve chosen a tapered leg because they work with all heel heights and most styles of footwear. Choose any style of denim shirt. Chambray, which is thinner than denim but has a similar textural effect, will also work. Wear it untucked to create the unbroken line. The washes of jeans and shirt do not need to be exactly the same, but keeping them fairly similar is the point of the column of colour. Choose a blazer in a bright colour and wear it over the denim shirt. The contrasting effect of the blazer breaks up the textural continuity of the column of denim. You don’t need to choose a blazer style if that’s not your thing. 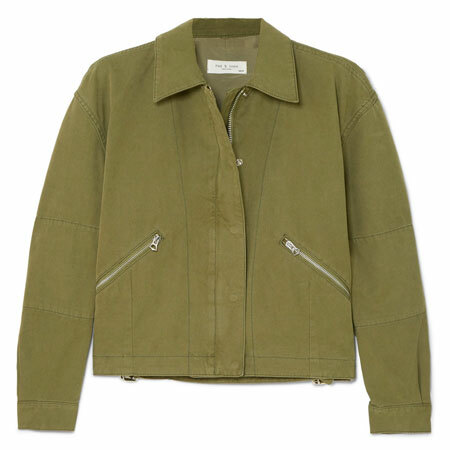 Cropped jackets, short trench coats and moto jackets can work just as well. You also don’t need to choose a bright colour. I chose brights because they are trending and feel especially fresh for Spring. Solid shoes will look great, but patterns pack more punch. Choose heels or flats, pumps, booties or ankle boots. I’ve chosen a low heeled retro Mary Jane, a rugged punk flat boot, and bombshell high heeled pumps. All three styles can be mixed and matched with any of the pictured blazers, creating very different moods. 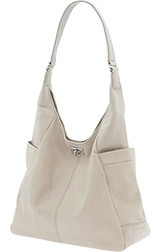 I like the idea of a neutral handbag with this combination because it compliments as well as tones down the colour. 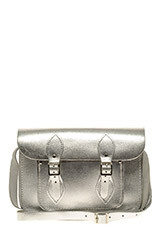 I’ve chosen a modern classic shoulder tote, a trendy silver satchel and retro satchel. As with the shoes, each of the handbags can be mixed and matched with the blazers to create a different mood. I’d stick to wearing my watch, wedding ring and specs as accessories, but you can wear the accessories of your choice. That’s always the point of these outfit formulas. I sew the seed of an idea, you take the next step by making the concept reflect YOUR style. 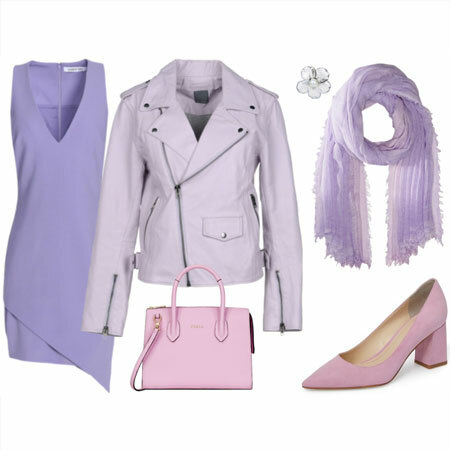 I wore an Autumn version of this outfit formula while attending Fashion Week in 2010, which was with black blazer, cream footwear and bright handbag. I’m going to swap things out this Spring and add in more colour. Some of the links in this post earn commissions for YLF. That reads very fashion forward and trendy to me! I can’t wait to see your visuals come spring, and everyone’s on the forum. I feel shy about denim on denim, it was a look I rocked as a tween. I have a peculiarity that I care more about how something looks from the back than from the front. When you arrange a column of color from the front and then add that third piece, then from the back you are very broken up. So I fuss with jacket length a lot, depending on the bottom piece and, yes, the brightness or noticability of the print. I also don’t wear jeans as part of any Look. And I haven’t let go of my couple of well-fitting denim jackets yet but they are pulled out of the wardrobe and on a Let’s Decide rolling rack. I only wear denim when I want to feel unnoticed and escape attention. I’ve been wearing double denim this winter for weekend wear, and I really like the addition of the bright topper and shoes. I’ll give it a try! I love it when you give formulas for outfits, Angie! Your Chanel formula inspired me to buy a striped tee, for example, that I have used a lot, even if I haven’t used the exact formula you described. For this formula I’m wondering about the length of the shirt vs the blazer/jacket. In your outfit the blazer seems to be just a little shorter than the shirt. Would it also work with a shorter jacket? I have problems visualising this. I love the idea of this with patterned shoes and a bright blazer. What fun! In fact, I’ve had my eye on that Gap blazer, although a red blazer would be a HUGE step for me to take. But what the heck, I’m on a roll. Have you had it on anyone yet? Thanks for another “formula”, Angie. I love them. Love this look! I think this would be a great formula for a “smart” casual look on Fridays. Lots of food for thought, Angie! I am not prepaired to sport brights on a blazer yet (no brights in my wardrobe at all, except a few summer items), but have just bought a good weight cotton cardi in a bright green like your middle one blazer(I don’t know why, but this colour captured my attention and my love at first sight as beeing easiest to match my own items). It has navy elbow patches so I thought on my very own (before reading your great post here:-) to wear it with a light blue chambrais shirt, navy chinois pants(or dark ink blue jeans), and black patent loafers for springy outfits. So glad, you posted this. I like it. I think I’ll be doing this *before* spring, since I have a couple of jewel-tone velvet blazers, and I like styling them casually. This formula is a great way to do that! This is a great casual look! I might try this on the weekend! I’ve never been able to get behind the denim-on-denim look, and I’m not the biggest fan of chambray shirts in general, so I shall pass on this look. I really love all the accessories you’ve chosen though! Angie, thank you for this new formula! It looks very bright and fresh to me and I can’t wait to try (or mangle) it using the items I have. Looks like I might need to do a bit of shopping, too! I absolutely LOVE this look and want to copy it for spring. 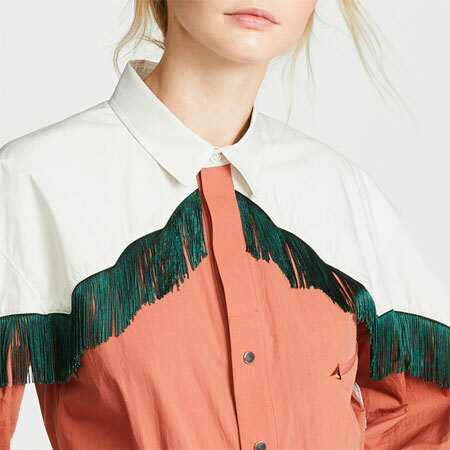 Does the denim shirt need to be a particular length to work for this (i.e. do you need to be sure it’s not too long)? And I assume the shirt should be somewhat fitted and not to boxy to work? Love this!! So right up my alley for weekend wear!! I love trying these formulas and can’t wait to shop my closet. The patterned shoe is a hole. I’m looking forward to seeing forum members sport this look. LOVE this formula. I am now a woman on a mission… chambray shirt, bright blazer and colorful shoes…. or bust! You’re making me pine for spring. At this point the only components I have are the jeans and a white bag. I guess I could count my oxfords as patterned shoes… but I’m feeling the need for something bright and fun! This is totally me, and I can’t wait to try it! But I’ll need to find the perfect denim or chambray shirt first. Also, I don’t own any patterned shoes or a bright jacket, so I might have to interpret with bright shoes, bright scarf or belt, and a patterned jacket instead! Those ASOS shoes are amaaaaazing! I wish they came in a pump with a higher heel! This looks really fun! I’m going to have to look for a denim shirt when I’m in the US next week. I also need to look for a colored blazer, or make one. 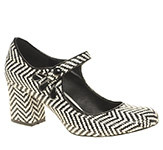 I am in love with those mary janes, too. 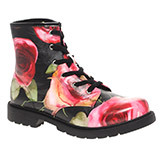 The floral doc-looking shoes are pretty great, too, although I think those might be a bit much for me. I think the pop of color with the blazer is throwing me off. I do like your fall version with the dark blazer, so I know I like the “column of denim.” I’m not sure I’d pull off the bright blazer as I could a dark one. My casual capsule is sadly lacking, so I’d LOVE to give it some freshening up with this formula. Thanks Angie…I am done with winter and ready for spring! I decided decades ago that I absolutely HATE chambray. Too much ironing! I’ll pass. I have a fitted denim blazer that I wear with dress pants and a nice top. That’s my way of dressing down, and that’s as down as it gets for me. I will never wear a denim top or jacket with jeans or even with denim trousers. Ain’t gonna happen ever. I am in a fashion funk and really needed this. Can’t wait to play with this formula. Will try this with my red blazer! I love formula posts! 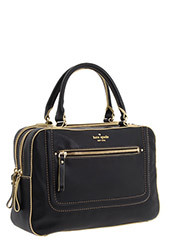 This one I particularly gravitate towards, although I lack a bright blazer…..can’t wait to see versions on the forum! I really don’t wear jeans, but those black-and-white shoes are loudly calling my name. Are they comfortable? Anyone have any experience with these? I love the the column of denim and this formula as a whole and would probably wear it every day, especially with those great shoes! Outstanding. I love this formula and will be working on this. Great! This sounds great and so simple. I can do this one. I have a question, do you ever wear denim on bottom with a denim jacket? I always feel so ambivalent about denim, yet I really like your Autumn version, Angie! And I esp. love the shoes you’ve featured. Sidebar: I’m not ready for spring, not feeling it at all. I’m seeing all these easter pastels and it’s now still light out at 5 p.m., and it’s making me feel icky. It was only last week we got our first rain/snow. I’m in! Will be trying lots of variations on this look for sure. Just what I needed to see on this chilly winter day! And, oh my gosh, those shoes are absolutely scrumptious! Great idea. I’ll try to put this together soon. Angie, I have this Ralph Lauren denim suit, with tapered pants with gold running thru the denim and jacket with large gold buttons with gold also running thru the material that I want to wear together, but feel it’s too much denim. Any suggestions? Beautiful – I can completely see myself wearing something like this even though I previously wasn’t a fan of denim on denim. Must. Walk. Away. From. All. Those. Cute. Shoes. Like Taylor, I do this a lot with a dark blazer and red handbag, and solid shoes. Adding a colorful blazer and patterned shoes would be radical! Great outfit. And now I know the difference between a Chambray and a jean shirt. I love the pattern shoes but I don’t think I can pull off the bright blazer. Deconstructed fashion! Really helpful post with all the details on each piece. It is especially helpful to me to see each piece separately so that I can figure out how to make it all work together. 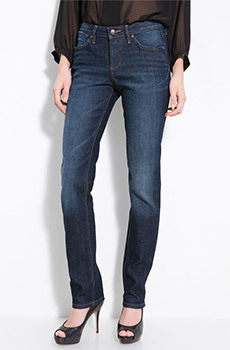 I needed to see more examples of denim with denim and this was very useful. This weekend I was wearing a new chambray (fitted) shirt and boyfriend jeans, when my husband asked “Who are you, Farmer Brown?”. The shirt and jeans were close in color, but pay attention to the jean style! I think this might have worked better with dark, slim jeans but then you lose the column look. Doubt I will attempt again, but love Angie’s 2010 look. Well, that is Saturdays look sorted, thank you! Oh oh oh! Great formula. You KNOW I am going to be all over this Angie! 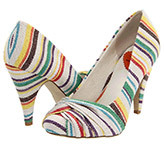 I wish they had those colorful stripped pumps in a flat. Love those to death! Now I need to be on the lookout for a colorful longer type blazer. This will be another great go to formula! If my new gold shoes work out, I could see those with the dark wash straight leg jeans that I recently found. I am already kind of on the hunt for a denim shirt and blazers- if everything falls into place I will give it a try. I have a feeling I’ll be sporting this formula quite often. Thanks for elaborating on all the separate elements, Angie, that’s always so helpful for me. The bright-coloured blazers feel like such a breath of fresh air right now. And I especially love how the patterned shoes pack extra punch. That’s the extra touch I probably wouldn’t immediately have thought of myself. I’m going to have a squizz at this asap. P.S. Those striped pumps are so much fun! Interesting! The concept sounds somewhat out of my comfort zone, and I don’t actually own a denim or chambray shirt at the moment…but if I did, I’d be game to give this a try! Perhaps with my turquoise jacket and a red or white handbag. When I finally find the animal print loafers that I’m determined to track down this year, I may well wear those. Otherwise it would have to be my cream and black ballet flats. I will likely create the column of denim, but I will use an inky blue ruffle top that matches my darker wash jeans –pretty much the same shade. (I guess it will be a column of dark inky indigo) I will add a bright yellow cardigan, as my blazers are mostly jewel toned or dark, rather than bright. Thank you for the inspiration. I have been on the lookout for colourful shoes for a while, so hopefully they will materialize soon. Sooooo useful. Love this post. I’m wearing it tomorrow. Chambray blouse, dark denim skinnies, leopard pumps, and a vibrant tomato red blazer. How awesome is that??? Thanks, Angie, you’re the best. I love this formula and I already have all the pieces. I can’t wait to try out this look! Thanks for the idea Angie! The first thing I thought was the items I missed for this formula but then I realized that I can do it with slight permutations once the weather allows it. I haven’t been very friendly with my denim shirts lately and his will bring them back to play.Thank you for always giving us new ideas. I can’t wait to see your interpretations of this formula, ladies! Shannon, the fit of the shirt needn’t be tailored at all. In fact, all my denim shirts are roomy. They have a nice contour to them though – so they are shaped. I like a regular versatile shirt length with a round hem. I love the sound of your versions Taylor, Suz, Kyle, Jenava, Michelle and Lydia. Brenda, perhaps you could provide a visual of the suit you are referring to. Then I can make more accurate suggestions for how to style it. Sandy, I don’t wear my denim jacket over my jeans, but it is a trend. I always love your formula posts, Angie – they always give so much food for thought. I was mentally shopping my closet for this look but – alas – I don’t have enough ingredients for this recipe. I own jeans and a tan handbag but I am lacking in the department of a bright blazer, patterned shoes and even a denim shirt. I cannot find a denim shirt I like for over a year now. 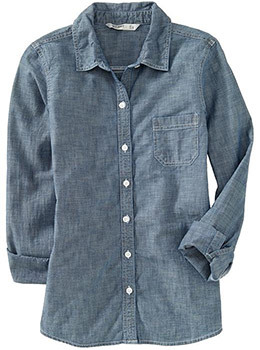 I have tried the ON one you pictured in your post but I did not like the quality of it: it is not chambray really but regular cotton in chambray color, pretty flimsy too. I do like this formula. I have always had a thing about wearing denim on denim but I can see how this works well. I don’t wear many collared shirts but a collarless chambray shirt could be a great addition to my wardrobe. I am definitely going to consider this and I lobe that this could work with quite a few variations. I need to do this NOW, before our version of spring (humid and HOT) rolls around, making blazers a mad-as-the-March-hare idea. Thanks for posting this pre-spring, Angie! No denim or chambray shirts in my closet for the last couple of years, but I’m going to try Lydia’s idea of indigo cotton. Perhaps a patterned red jacket, red crochet shoes and navy tote, darkening the overall palette a bit since I’m going for a winter story here. wow, everybody loves this post! blue on blue, I’m in. My only blazer is black, however. let me SmyC and see what I come up with. Love the idea! I bought a denim shirt recently and have been wondering how to combine it with jeans–this post is well-timed for me I don’t have all the elements to make this a colorful look, but I can try something like your NY outfit. I remembered that picture because I love your expression, but I forgot it was denim on denim. Another excellent outfit formula, Angie!! I don’t have a colored blazer, but I plan to try this with a bright cardigan. I love this look, I wear it often but now I know why it works for me!! Oh I adore this formula! 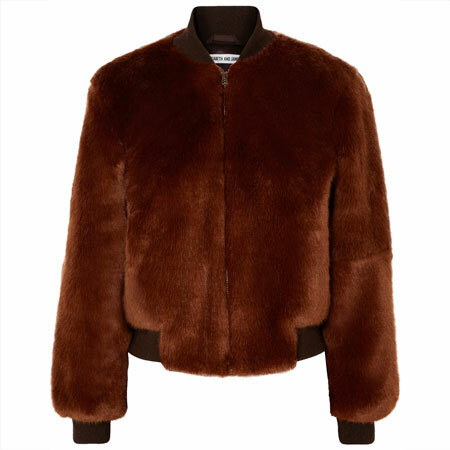 I will absolutely be wearing this once the weather warms up a bit. I have two bright blazers both through YLF meetups, and would love to get a couple more I’ve worn my denim jacket with jeans once or twice, but couldn’t get behind that look quite as much; now, pairing chambray with denim, THAT I love to do! I never thought of adding a brightly colored topper, though I’ve worn my white blazer over a chambray/denim outfit. The patterned shoes are a brilliant touch! Yay, I will definitely try this (making mental notes right now). Thank you, Angie! Coincidentally, I didn’t see this blog entry before I decided on a denim on denim outfit today. It’s not the formula you posted today, but a variation on an earlier denim on denim formula, which also impressed me. Chambray blouse, grey-navy striped pullover, blue jeans, grey boots, black and cream bag. It felt very fresh to my eye because I hadn’t worn this type of look much. And the blues look and feel very calming, too. Next I’ll go for a brighter element You know I love brights. Thanks so much for a great formula, Angie! I would very much like a denim on denim look BUT I could never quite figure out when I was looking at a denim shirt and jeans with a similar wash. Usually a chambray short is much lighter than a regular jeans color and I probably put too much thought into it and totally skipped the whole look. The Eddie Bauer medium wash chambray appears to be a slightly darker wash than other chambray shirts. 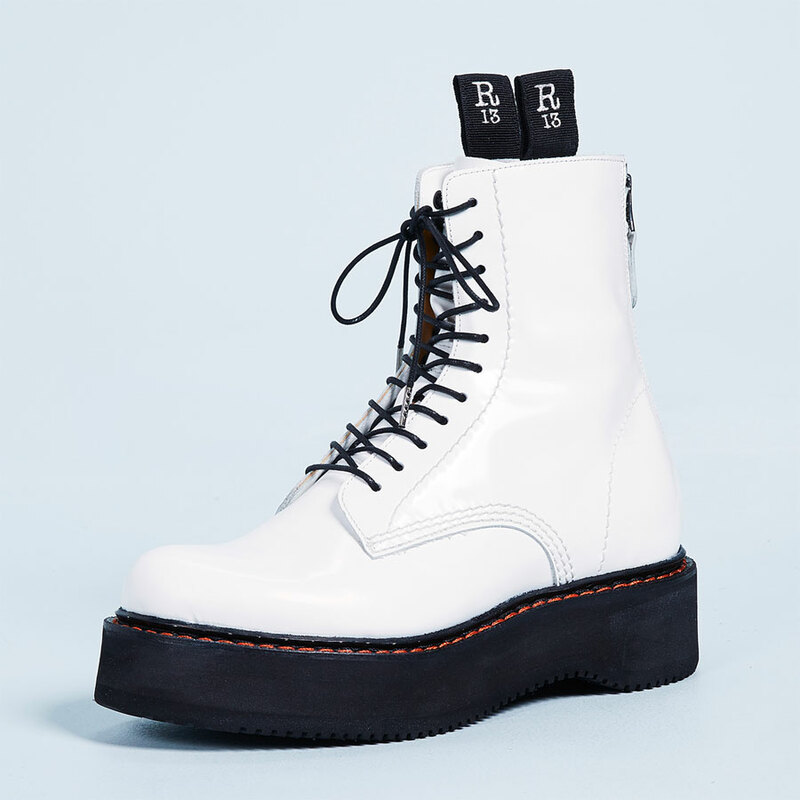 I would totally love to have the ASOS doc type lace up boots w/blazer but at over 60, I’m just not sure. It’s just that the boots are so darn cute!!! I linked to this link after looking at the express blazer in bright colors. I can’t decide if I like tthe column of color because it feels a little 80’s dated to me. I guess it’s a look that’s been out so long that it’s come back. Does anyone else feel that way? Coming back to say I just ordered those Rocket Dog pumps! Angie, I suspect you of posting them just for me! I have a maroon suit, that I wanted to wear with a pink shell or blouse underneath and suede maroon pumps. Is that too much maroon? If so, what color shoes would you suggest? I do like columns of color outfits, but I’ve never worn it with so much color.